The Investor relation department / Management of OZB - OZ Brewing Limited has decided that at this stage they DO NOT want to provide this information about their company. SharePrices.com.au apologise for this inconvenience and we will continue to contact OZ Brewing Limited in order to get permission to provide this detailed information on the SharePrices.com.au website as soon as possible. 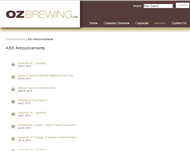 Please contact OZB - OZ Brewing Limited directly if you still wish obtain this information. 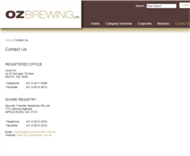 The Investor relation department / Management of OZB - OZ Brewing Limited has decided that at this stage they DO NOT want to display their products and services information. SharePrices.com.au apologise for this inconvenience and we will continue to contact OZ Brewing Limited in order to get permission to provide this detailed information. 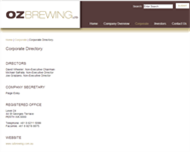 SharePrices.com.au has approached the Management of OZ Brewing Limited (OZB) for approval of this corporate profile. At this stage OZ Brewing Limited (OZB) have decided that they do not want to provide information regarding their general operations, products and services. The General Overview, Services, Products and Projects information for this profile was last edited on 11 Jun 2015.